Mudpies to Dragonflies: Speak Spider? 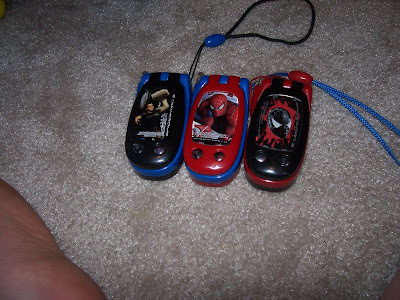 Are these not the coolest Spiderman cell phones you've ever seen? Whoo-hoo. One of the fun things about visiting old friends is that you get to participate in a "slice of daily life". Even though Kymberly was here we had to do the things we had to do. Laundry needed folding, dishes needed washing, stinky boys needed bathing. You get the picture. Kymberly's a load of fun and looks at every task as a potential game with the boys. Piling the boys in two carts at Stuff Mart gave us a reason to race and dash through the store, for instance. Picking out shorts for A was much more fun with Kymberly. I bet he thinks so, too because he now has a pair of camouflage shorts that I'm not sure I would have selected without her input. At the checkouts we had our carts piled high and were waiting in line. The boys immediately spied ("with my little eye") a box of little Spiderman toy cell phones. And, wouldn't you know it? There were three different designs! Each boy was loving a cell phone. I let them hold the toys with no intention of purchasing said toy. Yea, I don't have to tell you that I bought them. The boys were so excited about them. They beep and light up and look so cool! When you push some of the buttons Spiderman talks to you. D was showing me the buttons and he asked me what Spiderman was saying. I didn't know. I said, "Don't you know?" He replied, "I don't speak Spider!"